…between King Street and Spencer Street, way up above eye level. You can see the same spot in Google Streetview, from before the signs went up. ← Previous Previous post: Which is cheapest? Wow. That was one of the best things he’s done…. …..and to think now that the ‘getting tough on boat people’ idea is out there makes me feel even sadder. Exactly what are the benefits Australia has reaped from the best thing Kevin Rudd has done? He’s the primeminister, we shouldn’t be judging his performance on token warm and fuzzy speeches. This was all just a PR stunt. What’s one of the best things he’s done as y’know… a prime minister? Yes that Stephen Harper quote is clearly designed to trick the naive into thinking that such a program ran in Australia. Naive people who can’t/don’t read. It does refer to “the government of Canada”. Are there people in Australia who don’t remember who the primeminister of Australia was less then two years ago? may be that it was, but i’m sure it meant a lot more to a lot of people. Yeah, it’s meant a lot to all those Aboriginals who have have been lifted out of poverty since Little Kev’s speech, right!? By the way, how come all of those who criticized John Howard for not apologizing to the ‘Stolen Generations’ weren’t as critical towards Gough Whitlam, Malcolm Fraser, Bob Hawke or Paul Keating, all of whom were in attendance that day, for not apologizing when they were in office? I thought it was a PR stunt too. If he really is sorry, he would have done more than post an apology and actually help the living conditions of these aboriginals. Re #8: Andrew V, I trust you don’t need to be reminded that it was Howard who was called upon to apologise because the National Inquiry into the Separation of Aboriginal and Torres Strait Islander Children from Their Families delivered its report about a year into his first term. Australians could claim to have been (and probably were) largely ignorant about the issue before 1997, but there was no longer any excuse. The inquiry was unprecented in its scope (hearing submissions from hundreds of former wards of the state) and formal apologies were recommended at that level for the first time. Most of the states apologised within months, so the lack of a response by the Commonwealth itself was increasingly conspicuous and bewildering. Howard didn’t need to make it the big deal it became. 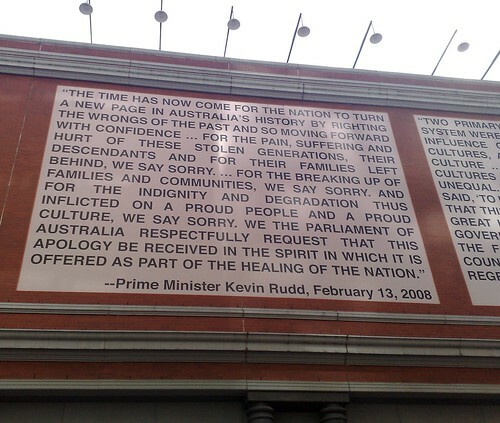 Indeed, when Rudd did finally apologise, he was implicitly apologizing not only for the original policies of separation, by also for a decade of petty denials of the importance of symbolism. The notion, which persists in some these comments, that we could have only one of (a) the symbolic act OR (b) practical measures, is unfortunate. Bob gave us a day off when we won the Americas Cup and Paul gave us the “recession we had to have” not to mention a “recalcitrant” foreign head of state. Malcolm pointed out to media folk (and the rest of us listening at the time) that what political parties promise during election campaigns is rubbish (my word, not his, but I’m summarising). Midnight Oil sang “it belongs to them, let’s give it back” – and Gough, although he didn’t say sorry, at least started to give it back. More than can be said for any of the others — until Kevin.